Historian Who Coined the Term "Renaissance". 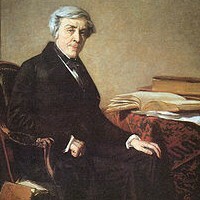  First to Coin the Word "Renaissance"
First to Coin the Word "Renaissance"
One of the accidental art critics of the 19th century, Jules Michelet was a French nationalist historian, best rembered for his epic masterpiece "The Story of France" (Histoire de France). His contribution to the history of art lies in the fact that - in his Histoire - he was the first historian to coin the word "Renaissance" (the French word for "Re-birth"), to describe the cultural resurgence that occurred in Italy during the 15th century and which led to a new conception of mankind and our place in the world. Since Michelet, the term "Renaissance art" has become the standard term for the architecture, as well as painting and sculpture, created in Italy during the quattrocento and cinquecento. Without Michelet, it is unlikely that we would now be using terms like "Renaissance architecture" or "Renaissance sculpture". Note: For other historians of Renaissance art, see: John Ruskin (1819-1900), Bernard Berenson (1865-1959), Kenneth Clark (1903-83) and Leo Steinberg (1920-2011). Born in Paris, shortly after the French Revolution, his father was a master printer of Huguenot origins. Although Michelet too was offered a place in the imperial printing office, his father insisted that he attend the famous college known as Lycee Charlemagne. A gifted student, by 1827 he was a Professor of history and philosophy at the Ecole Normale Superieure, with several textbooks to his name. In 1833, now appointed head of the historical section of the French National Record Office, he began writing his life's work on the history of France. Completed (almost) in 1867, it comprised 19 volumes, from the earliest account of the Franks and King Charlemagne, to the outbreak of the Revolution. The period c.1400-1700 occupies a total of 8 volumes, much of which is only very distantly connected with French history per se, especially in the two volumes entitled Renaissance and Reforme. It is here that Michelet first uses the terms "Renaissance" and "Renaissance art" to refer to the Italian Rinascimento, exemplified by the works of Filippo Brunelleschi (1377-1446), Donatello (1386-1466), Masaccio (1401-1428), Leonardo da Vinci (1452-1519), Raphael (1483-1520), Michelangelo (1475-1564) and Titian (1477-1576), to name but a few of the great painters, sculptors and architects whose work defined the age. According to Michelet, the Renaissance process was triggered by the voyages of Columbus in the 15th century, and the scientific achievements of Copernicus and Galileo in the 16th, all of which caused a decisive shift from the narrow, religious Medieval world, towards the modern world of science and rationalism. This view of the Renaissance was further developed by the Swiss historian Jacob Burckhardt, in his book "The Civilization of the Renaissance in Italy" (Die Kultur der Renaissance in Italien), published in 1860. In Burckhardt's eyes, the Renaissance was exclusively an Italian phenomenon, engendered during the 15th century in the rival city-states of Northern and Central Italy, where the artistic talents of great architects and artists flourished, thanks to the support of patrons like the Medici family in Florence, and the Popes of Rome. Both Michelet and Burckhardt thought that the cultural achievements of the period - while reflecting a "rebirth" - were nevertheless a continuation of European culture, originating in classical antiquity. Note, however, this interpretation has its critics, who claim that neither historian understood how changing patterns of finance, commerce, science and above all cultural and commercial exchanges with other cultures, shaped the new European Renaissance. Famous for his insistence that historical works should focus on the people of a country, not simply its leaders and its institutions, Michelet was one of the first modern chroniclers to apply this principle to historical scholarship. Following his death from a heart attack in 1874, he was finally interred at Le Pere Lachaise cemetary in Paris.  For more about historians of the Italian Rinascimento, see: Homepage.